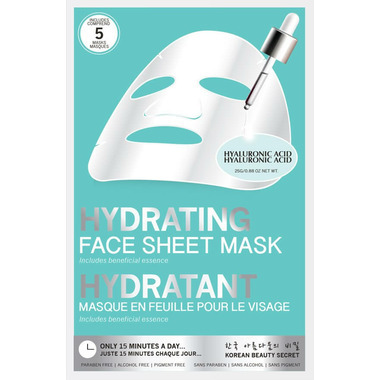 Infused with Hyaluronic Acid, this Hydrating Sheet Mask helps to keep skin looking hydrated and aids in the apperance of skin plumpness. Danielle Creations' Sheet Masks are the ultimate nourishment for your face! Each mask uses a unique fabric blend that tightly hugs the contours of the face allowing for the most effective penetration of the beneficial essential ingredients. These masks are very reasonably priced but they donâ€™t seem to fit my face and were too small. Because of this I would not repurchase. I agree that there is no Serum left over. It may be that you get what you pay for. These masks fit nicely and were hydrating. The price isn't bad either. But, I've used other affordable masks that made more of a difference which is why I only give 3 stars. There isn't as much left over serum left in the packet as other ones either. I like to clip the packets shut and save them to pat the leftovers onto my skin inbetween sheet mask uses. To notice a difference of a product, you need to use it for a while and there just isn't enough serum to do so. But they did feel nice to use. I wouldn't recommend them or buy them again but, I will use up the ones I have. It is a nice refreshing mask. I didn't notice any amazing results, but it does give your skin a bit of moisture. Definitely awesome for hot summer days when you want to cool the skin a little. I don't think i will repurchase but it was a nice experience to use it. Very nice mask, I can understand why they sold out.